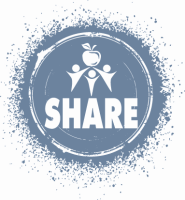 Every month SHARE publishes a print and online version of our menu. The menu is comprised of frozen food, meats, vegetables and other grocery items all of which are organized into “Food Packages”. To buy one or more food packages you either place and pay for your order with your local SHARE distribution location or order online and pay with a debit or credit card. All online orders are processed via our secure paypal credit card system. Every month on the Food Pickup date, a team gathers to help with the distribution of food for our SHARE food program. We can use your assistance for any and all of these steps, so please join us when you can! 10:30-Leave to get food at Bellevue East. 10:45-Arrive at Bellevue East if you want to meet there. 11:15 to 11:30-Return from Bellevue East. Set up food lines. 11:45 to 12:30-Distribution of food (pick-up time for customers). 12:30 to 1:00 PM Clean up.